Me at the Main Building … this was from Year 1. 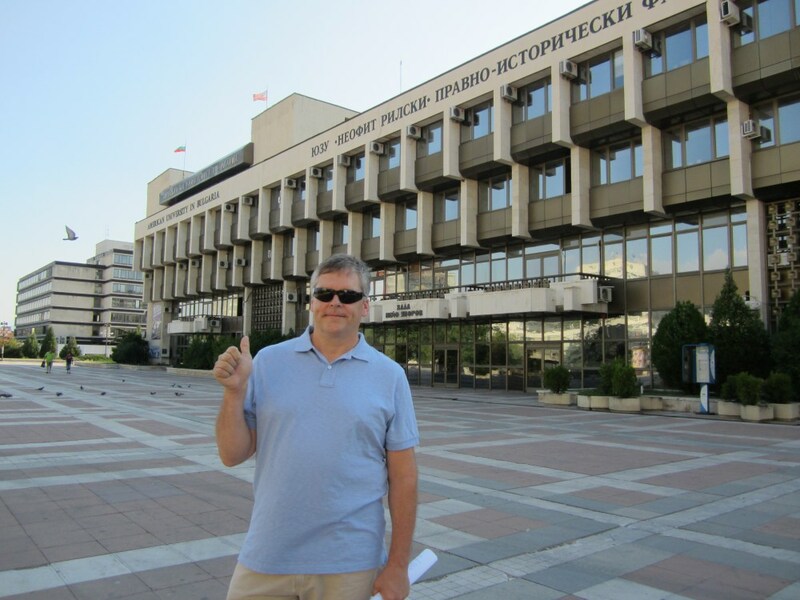 Usually, when I enter AUBG’s Main Building, I stride up the steps, enter the third floor and head straight for my office. Today, I turned left instead of right. I wanted to check my mailbox. It’s a habit and I’m a creature of habit. Occasionally, I’ll discover some official document in there. … More often than not, it’s empty. Still, I check. Happy day at the mailbox (ignore the misspellings). It’s the thought that counts! On days like this, weeks like this, it’s hard to put into words how this simple gesture touched me. But words are all I’ve got so I’ll give it a shot. 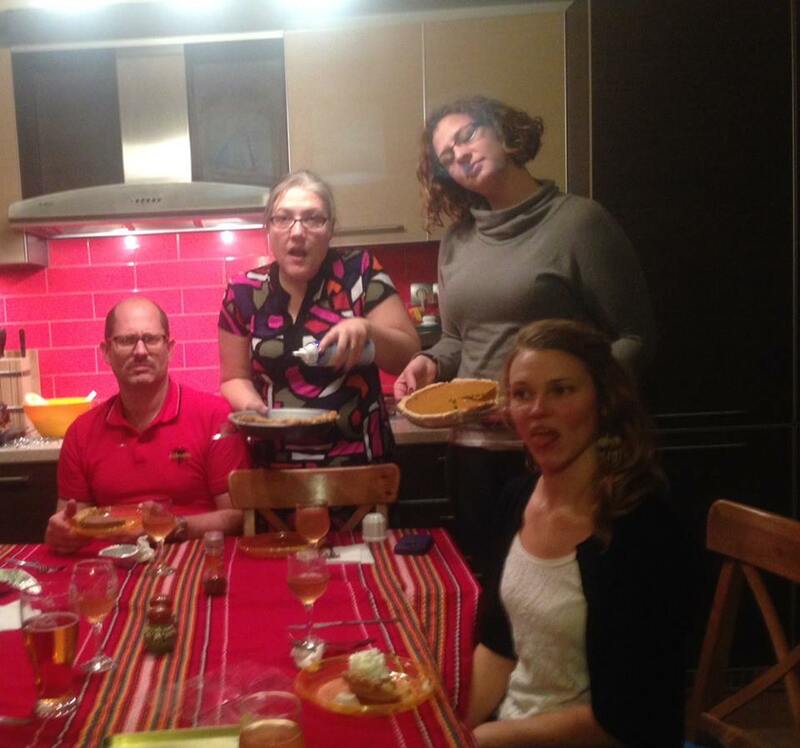 We have just emerged from our fourth Thanksgiving in Bulgaria. It’s at times like these when my mind drifts to holidays of yesterday. Those cold, late-November days in the woods hunting with my dad and brothers. Mom’s savory meals. Traveling as a family unit with Melody and Jenna. The laughter. Hell, even the acrimony (it’s a family after all). And I miss all of it. I wonder: Will it feel the same when we return? Have I romanticized the good? Shrouded the bad? When will we return? Will we ever return? The crew at our ex-pat Thnaksgiving celebration (not pictured, the turkey and one half of our hosting couple, Lynnette Leonard — the photographer in this one). Our hosts (from left), Mark and Lynnette, with friends Tracy and Liza. 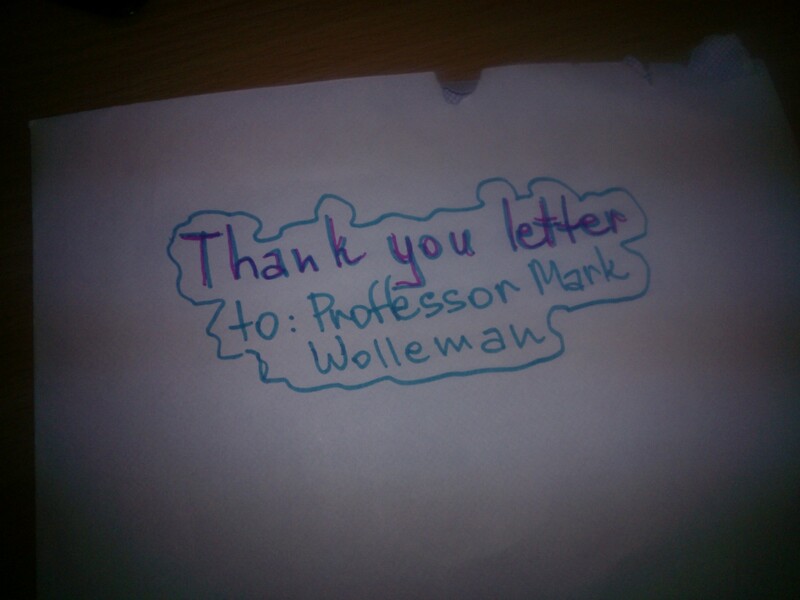 And so I thank this student for going to the trouble of writing this thank you note. You touched my heart. You reminded me — at the perfect time — to appreciate this day, even if I spent the best part of it in my stupid office. You reminded me to be thankful for that — and for this journey, no matter how long it lasts and no matter where it ends up. Nice story Mark, sometimes it is the little things that remind you to take a breath and think! I,m one of the lucky one’s, everyday I wake up thankful and happy for where I am, the friends I have, and the place I call home. Never loose sight, there are some out there that are blind to things like that!! What a beautiful post, Mark. 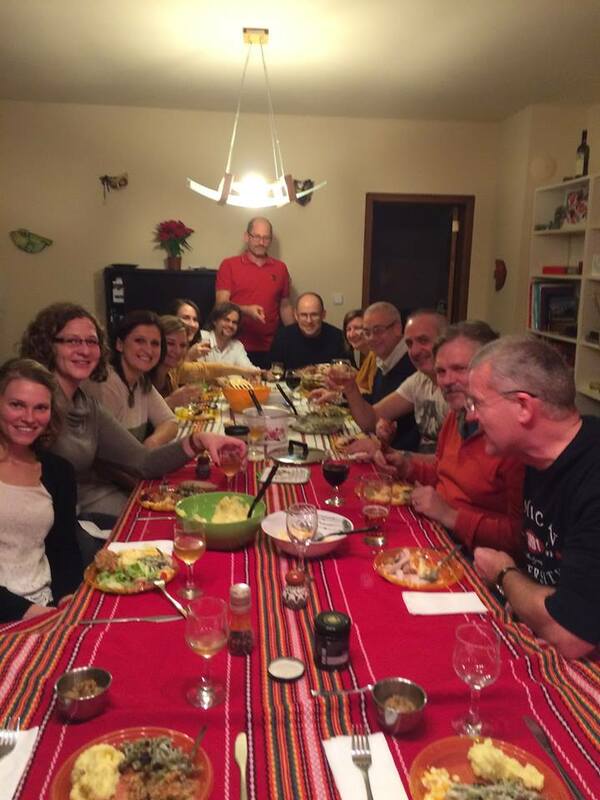 Your musings about family Thanksgivings past — and the contrasts with your present life in Bulgaria — were a powerful reminder that in life we always have to make choices … and making choices inevitably means giving something up. So I’m very grateful for the student who took the time to give you a tangible reminder that your choice to teach in Bulgaria is making a HUGE difference in his/her life, and for your other students. So hats off to you as you savor the old memories, live the hell out of your time in Bulgaria, and look forward to a long and joyous future full of wonderful new adventures. And on a more personal note: Thank you, from the bottom of my heart, for your kind words. I am deeply touched … and honored. Enjoying Bulgarian beer, Georgian wine and nice notes from friends. Thanks, Heather! Thanks, Mark, for a wonderful post. And, thanks to “Professor Wollemann” for his teachings to a “young” (sorta) news assistant who uses them to this day. As always, I am very grateful. Thanks, Annie! And thanks for reading.